Yet unfortunately there are not many places in the city that date from the Roman era apart from the Arenes de Lutece, which is the Roman Arena and the Gallo-Roman baths in the north, known as the Thermes de Cluny, which are the best preserved thermal baths that you can still discover in Paris today. The Thermes de Cluny Gallo-Roman baths are the most spectacular examples of the ancient architecture that is still preserved in the city, especially considering the near continuous use of the building since the Middle Ages. The baths were made into different spaces that were for either the public or the services along with subterranean structures and you can see certain rooms clearly defined, with some being incorporated within the Musee de Cluny, which is also known as the Musee National du Moyen Age. Outside with the grounds of this museum in Paris there are the ruins of the Caldarium, which is the hot water room located to the west bordered by the Boulevard Saint-Michel, yet there is also another caldarium to the south at the corner of Boulevard Saint-Michel and the Rue du Sommerard. 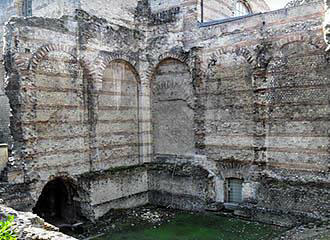 Plus there is the Tepidarium, which is the warm water room and these have been in ruins since the 17th century. However inside you can discover the Frigadarium, which is the cold room and this is completely enclosed in the museum with a 15 metre high vault and the high walls have conserved their original structure. In fact, the unique structure with small square stones spaced at regular intervals into rows of bricks, the walls were also covered in mosaics, marble or paint and the Frigadarium within the Musee de Cluny still has traces of these today. There is also a fragment of mosaic on display, which could well be all that is left of the original structure that were once one of the main highlights and landmarks of Roman civilisation, which makes the Thermes de Cluny one of the unique tourist attraction in Paris. The grounds and medieval garden of the Musee de Cluny are open daily from around 9am to 5.30pm and are free to enter. 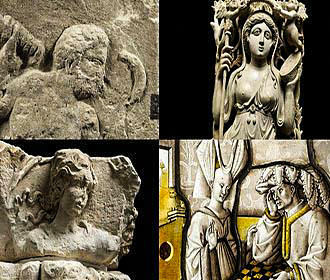 However, if you wish to discover the parts of the Thermes de Cluny that are located within the museum, then there is an entrance fee to access these and the rest of the Museum of the Middle Ages. When it comes to getting to the Thermes de Cluny, you will find them located in the 5th Arrondissement close to the Sorbonne and the Place Saint-Michel situated near the River Seine with the Fontaine Saint-Michel that is the tallest fountain in Paris. Arriving on the public transport in Paris you could utilise the Metro stops called the Cluny - La Sorbonne, the Saint-Michel or the Odeon stops, whereas if you are travelling on the RER you would need line C for the Saint-Michel stop or line B for the Cluny - La Sorbonne stop. Alternatively the bus numbers 27, 38, 63 and 86 will also get you close by. The Thermes de Cluny are the ruins of the Gallo-Roman thermal baths, which are the best preserved in the city that were constructed in approximately the 3rd century and some are a part of the Musee de Cluny which is also known as the Musee National du Moyen Age. 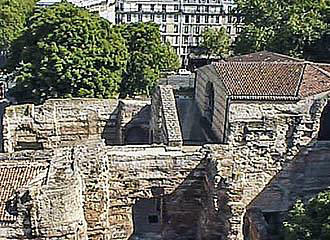 There was once a massive bath complex constructed in Paris at approximately the start of the 3rd century, that were believed to have been constructed by boatmen of Roman Paris, which at the time was known as Lutetia. All Roman Baths were designed to be freely open to the public and there were thermal baths constructed in the east under the College de France, in the south at Rue Gay-Lussac and in the north, however, unfortunately over the many centuries the majority of these are complete ruins.